Cholinesterase inhibitors, which are commonly used to treat dementia, may increase the risk of adverse weight loss in people 65 and older, reports a new study by researchers at the University of California, San Francisco (UCSF). 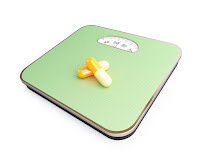 Because severe weight loss can ultimately result in death, the findings suggest that clinicians should consider this risk when prescribing cholinesterase inhibitors such as donepezil (Aricept), galantamine (Razadyne), and rivastigmine (Exelon). While previous studies have suggested an association between cholinesterase inhibitors like donepezil or galantamine and weight loss, the new analysis provides the first evidence of clinically significant weight loss in a large, real-world population. The researchers, led by Meera Sheffrin, M.D., a geriatrics fellow at UCSF School of Medicine and San Francisco Veterans Administration (VA) Medical Center, used national VA data from 2007 to 2010 to evaluate patients 65 or older who had been diagnosed with dementia and recently received a new prescription for a cholinesterase inhibitor or a different chronic medication; they identified 1,188 patients on cholinesterase inhibitors and 2,189 matched controls on other medications. After 12 months on the medications, 29.3% of patients on cholinesterase inhibitors experienced significant weight loss (defined as the loss of 10 or more pounds) compared with 22.8% of the patients on the other medications, which corresponded to a 1.23 fold increased risk of weight loss in patients prescribed cholinesterase inhibitors. The study authors noted that further research is needed to validate these findings and identify patient subgroups that may be at the greatest risk of weight loss from cholinesterase inhibitors. Because the population included in the study was primarily male veterans, additional research is needed to assess the applicability of the findings to women. The study was published online today in the Journal of the American Geriatrics Society. To learn more about the risks and benefits of cholinesterase inhibitors, see the APA’s Guideline Watch on Alzheimer's Disease and Other Dementias.